From wastepaper, nylon and coconut fibers, artisans and students in Mekong Delta provinces make unique art and handicraft products, while aiding environmental protection efforts. Lam Chieu Dong, an artist in Mekong Delta province of Vinh Long, specializes in collages. Using color paper and magazine covers, he tears out and attaches selected portions systematically, to form beautiful and lively pictures. Dong makes wastepaper harder and rougher, then cuts and pastes it into pictures. He said it is complicated to make good collages, because it requires patience and the time to get good products. His collages have won awards at the fine arts exhibition in the Mekong Delta region. He also paints with lacquer on fake paper and makes sculptures using fake stone, fake wood and fake bronze. 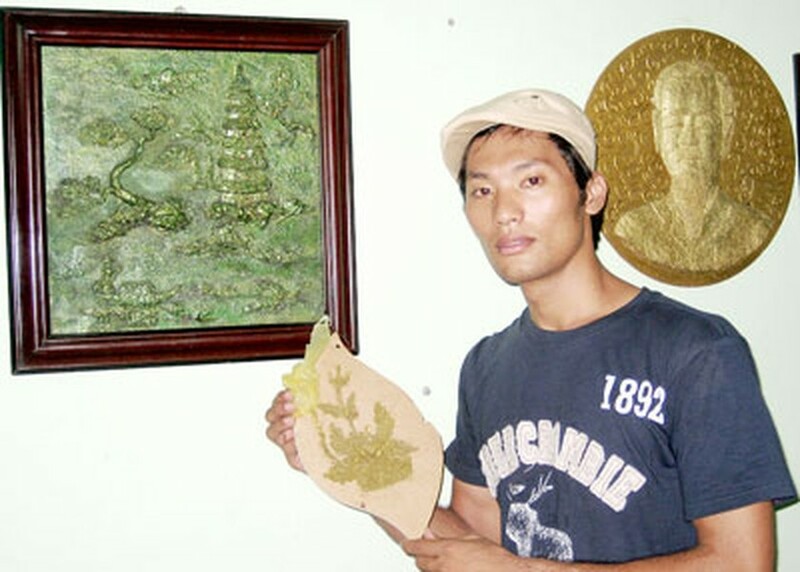 He made an artificial bronze statue of the Bodhisattva of Mercy using sponges; it weighs less than 300 grams and has yet to deteriorate with the passage of years. Three students at Can Tho University including Quach Van Den, Ly Van Loi and Tran Thanh Toan cooperated to open a 3R-Goods shop. 3R means Reduce garbage, reuse and recycle. The shop collects old books, magazines and buys pictures, picture frames and artificial apricot blossoms made from nylon, eggshells and coconut fibers. Customers have been surprised to find the products are made from recycled materials, such as apricot blossoms made from nylon, which have been a bestseller lately. The theme of environmental protection presents itself throughout Lam Chieu Dong’s art products such as “Danh Ca” (fishing). “Mua khong ca” (season without fish) portrays the anguish of fishermen and residents of the Mekong Delta region, whose fish have become extinct. He said people unmindfully throw away wastepaper, but he encourages them to turn them into art. The 3R-Goods shop’s purpose is to reduce the effects of climate change, said Quach Van Den. Den said money collected from selling products in the shop will be used to spread the message and help students recognize necessity of environmental protection.